With over 80 quilts and dozens of rugs on hand it is impossible to show you all of them here. 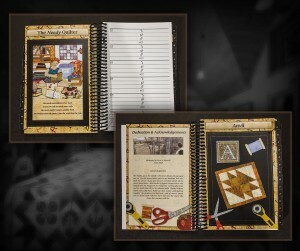 Inventory is constantly changing. If you are interested in making a purchase or are looking for a certain size, colour or style contact us and we can send you more photos and information. 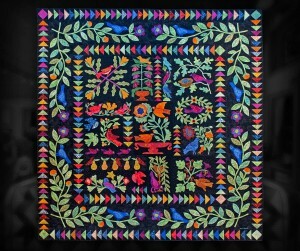 We are also happy to work with you on special commissions. 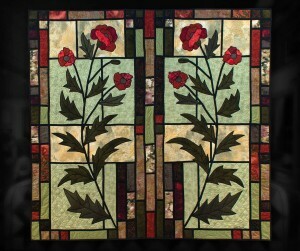 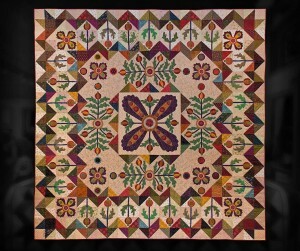 From the following, select Traditional Quilts, Modern and Art Quilts, Hooked Rugs or Other Fun Stuff. 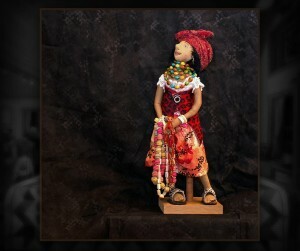 Select All to view images from all categories. 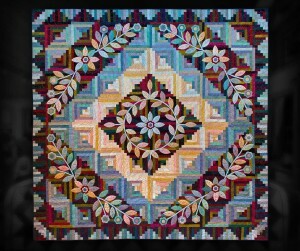 Tap or click for larger version of image, tap or click the (X) on the top right of the enlarged version to return to this page. 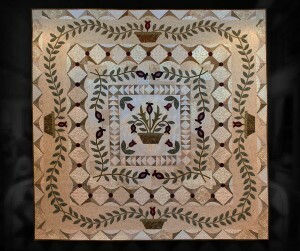 98″X98″, machine appliqué and custom machine quilted. 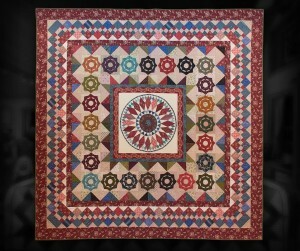 101″X101″, machine appliqué and custom machine quilted. 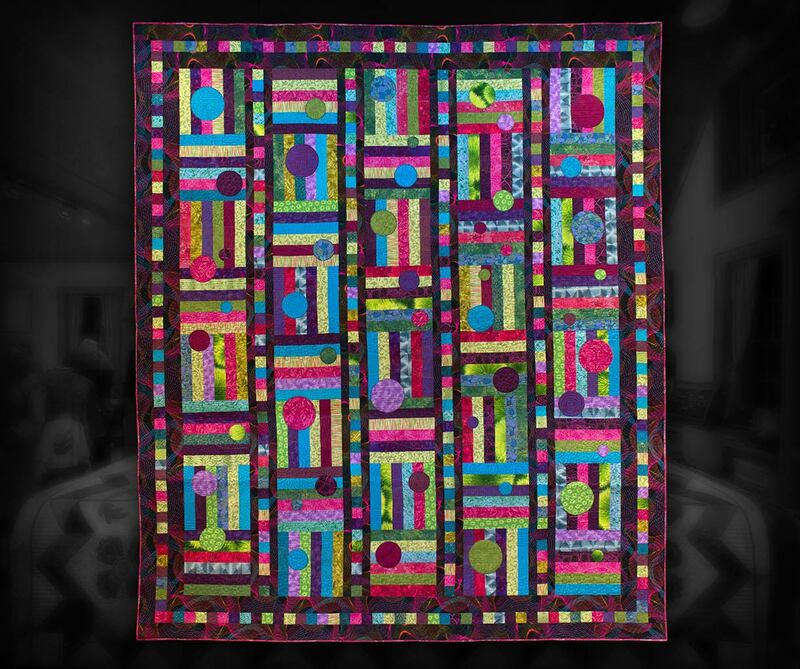 96″X96″, machine appliqué and custom machine quilted. 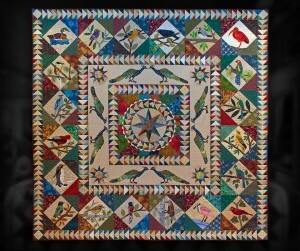 100″X100″, hand appliqué and hand quilting. 92″ x 92″ – Hand and machine pieced, custom machine quilted. 86″ x 86″ – machine appliqué, custom machine quilted. 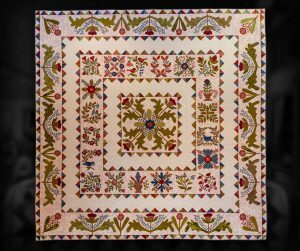 90″ x 90″ – machine appliqué and custom machine quilted. 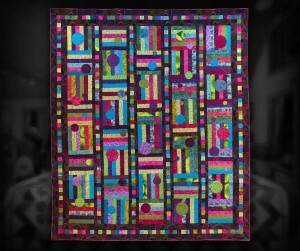 83″ x 86″ – machine appliqué and custom machine quilted. 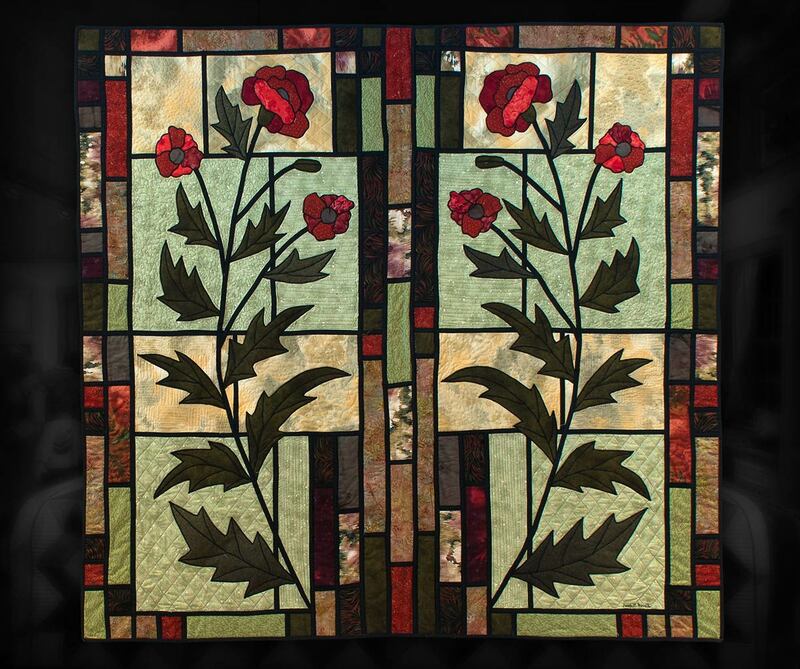 93″ x 93″ – machine appliqué and custom machine quilted. 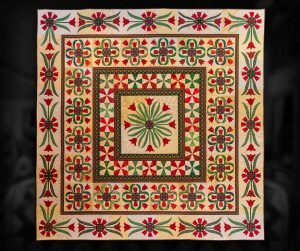 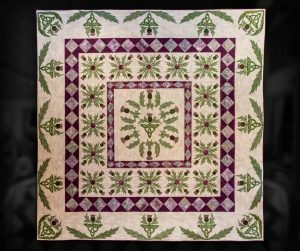 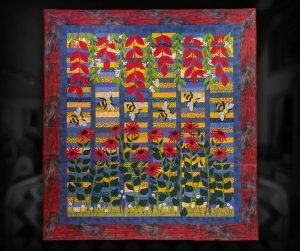 92″ x 92″ – hand appliqué and densely hand quilted. 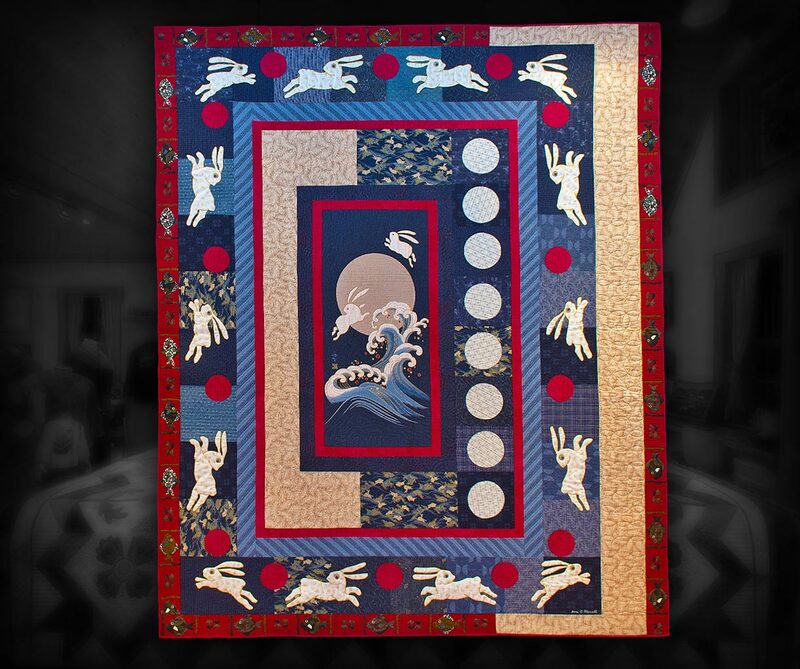 84″X90″, machine appliqué and custom machine quilted. 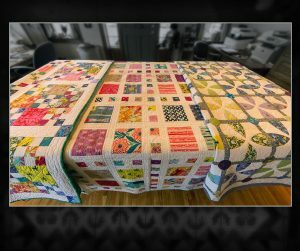 All queen size and custom machine quilted. 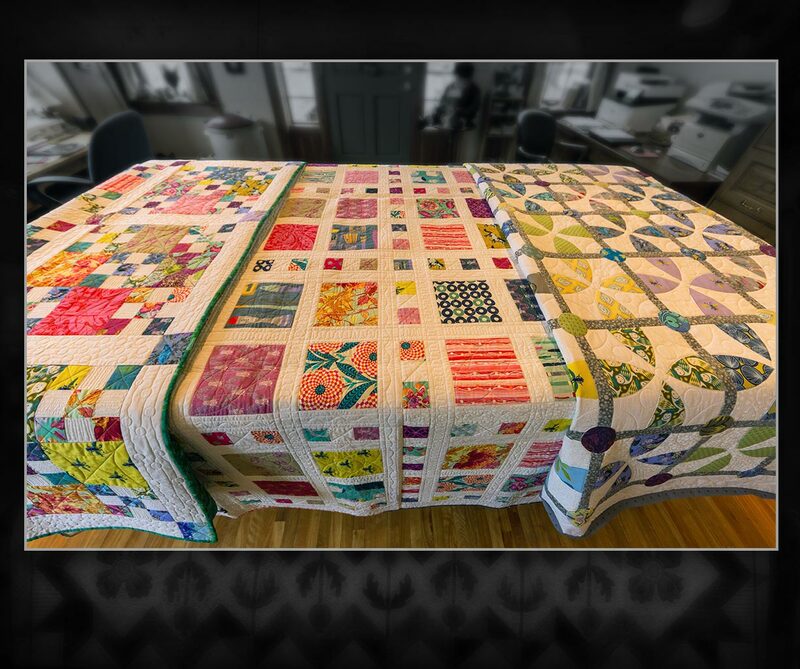 88″ x 88″ – pieced quilt with custom machine quilting. 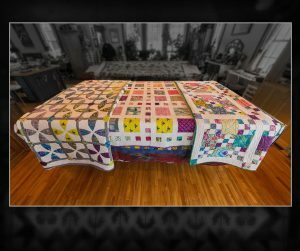 96″ x 112″ – machine piecing and appliqué, custom machine quilted. 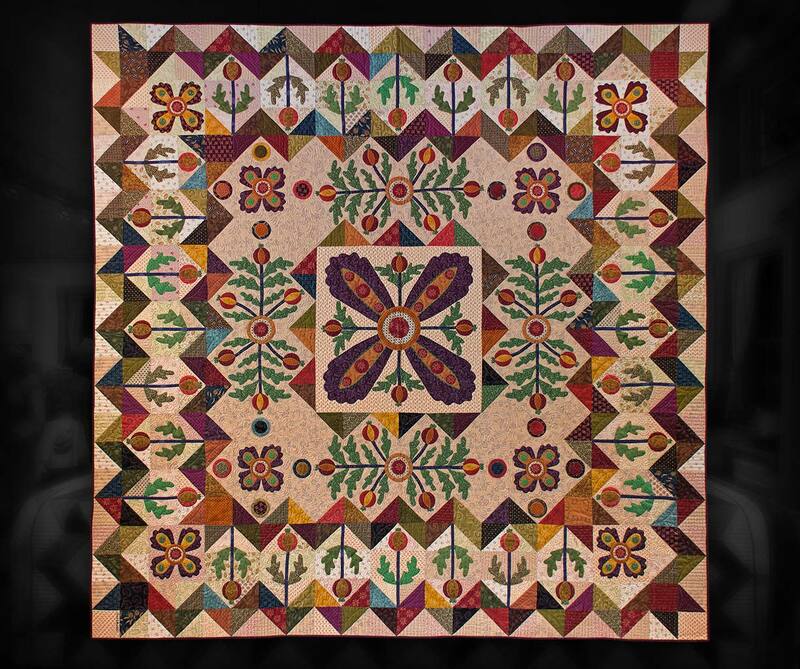 80″ x 98″ – machine piecing and appliqué, custom machine quilted. 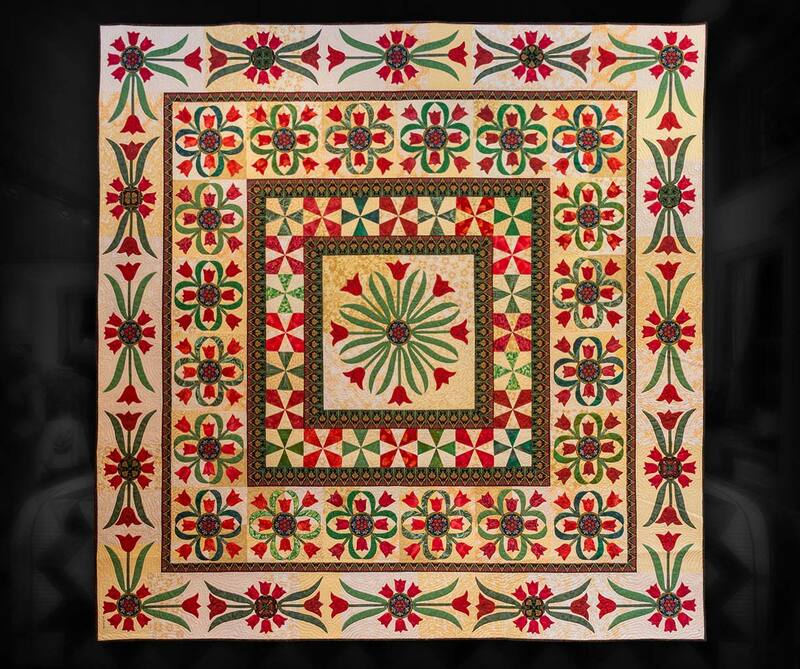 49″ x 47″ – machine piecing and appliqué,custom machine quilted. 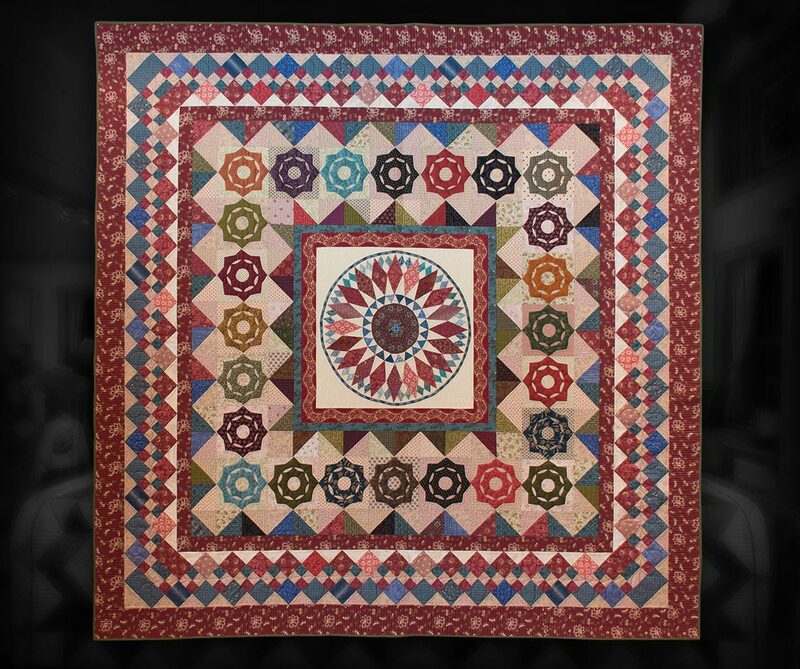 Machine appliqué and quilting. 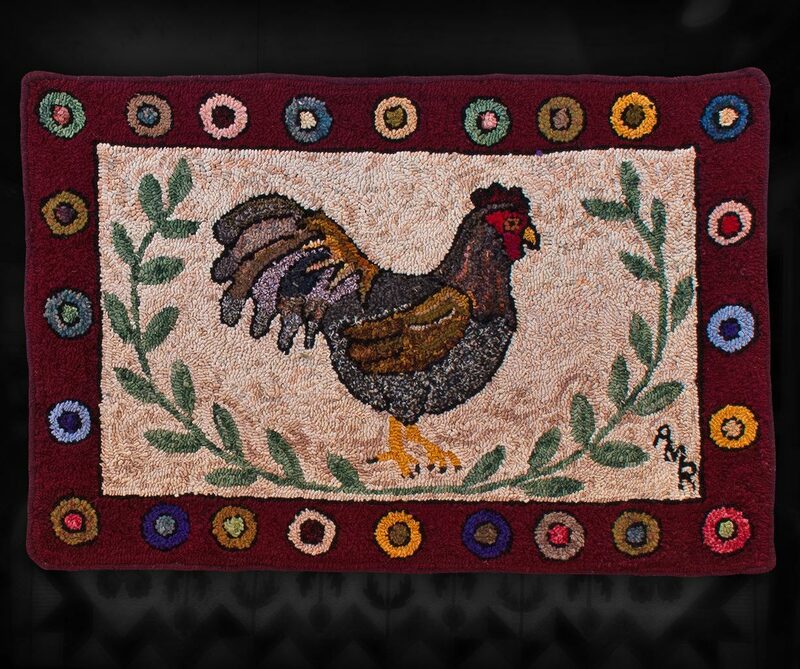 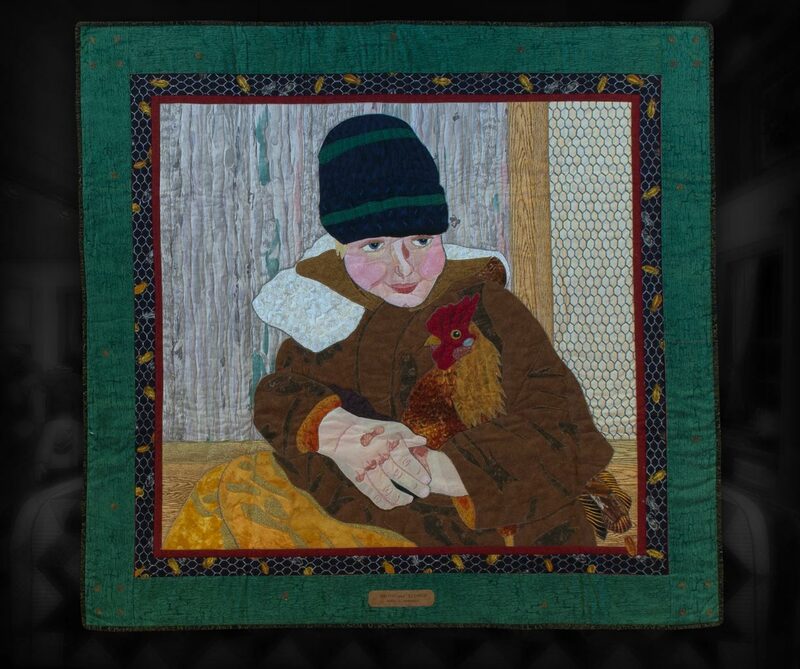 This wall quilt is a portrait of my son as a little boy and his pet Bantam rooster. 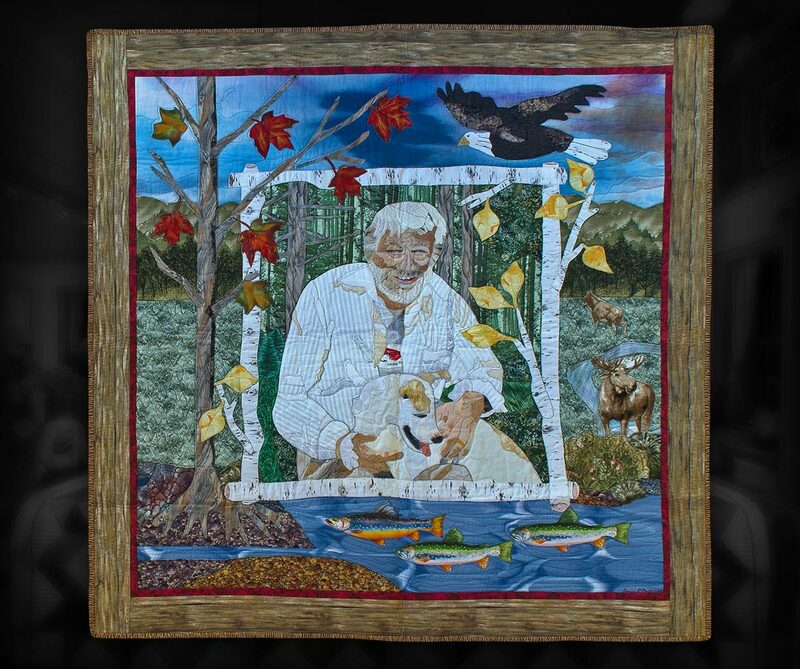 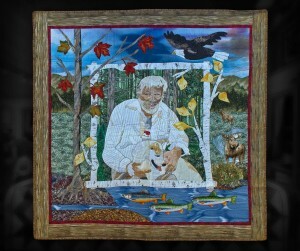 In this appliqué wall quilt I portrayed my neighbour and his dog in their environment. 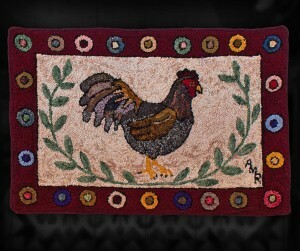 24″ x 36″ – wool hooked rug suitable for the floor or wall. 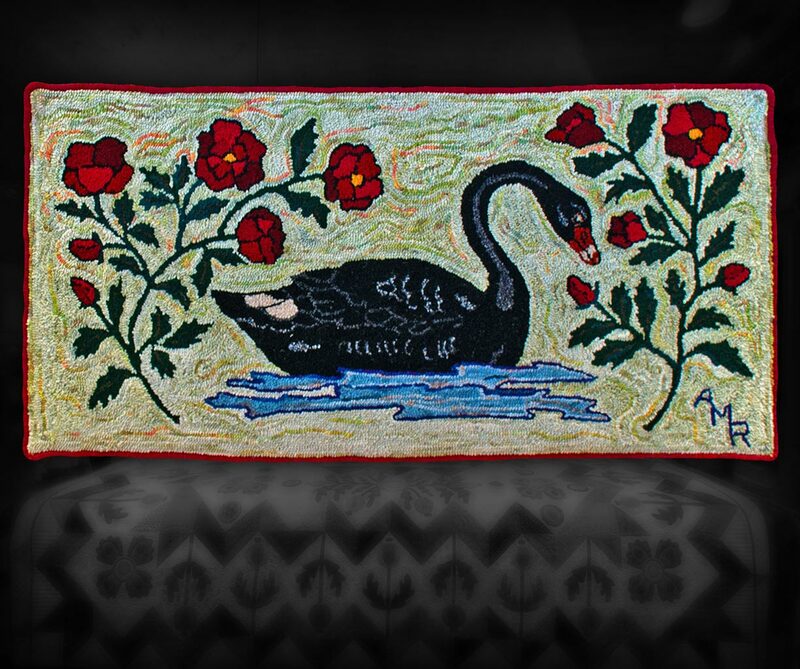 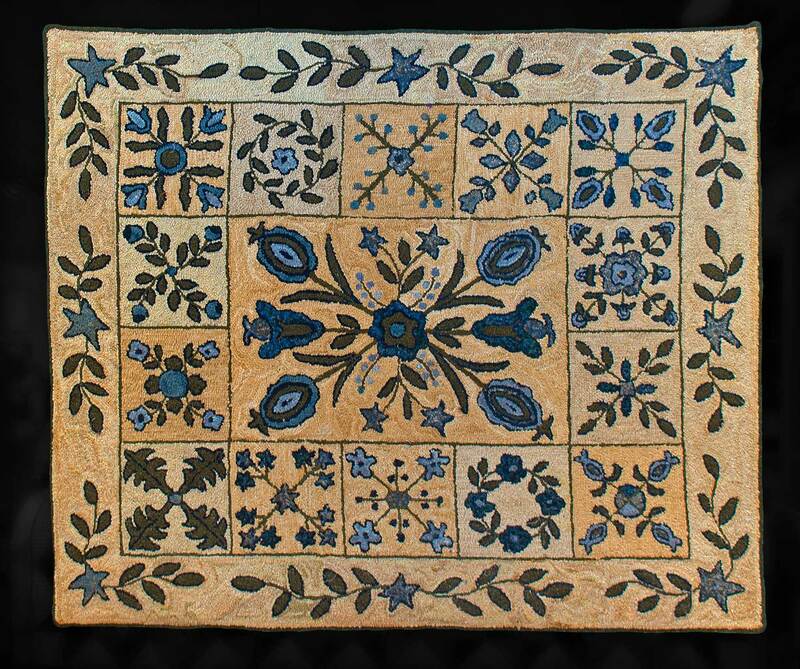 25″ x 49″ – wool hooked rug suitable for the floor or wall. 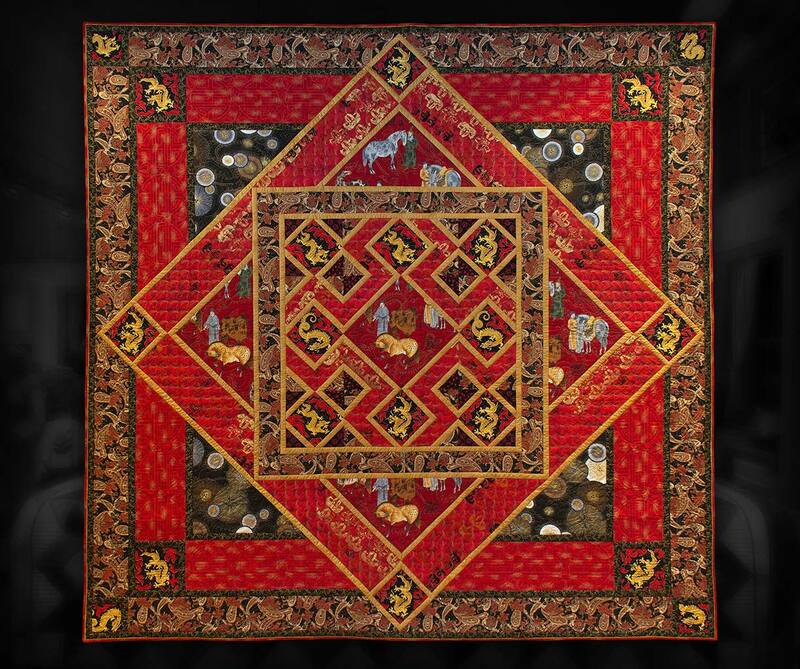 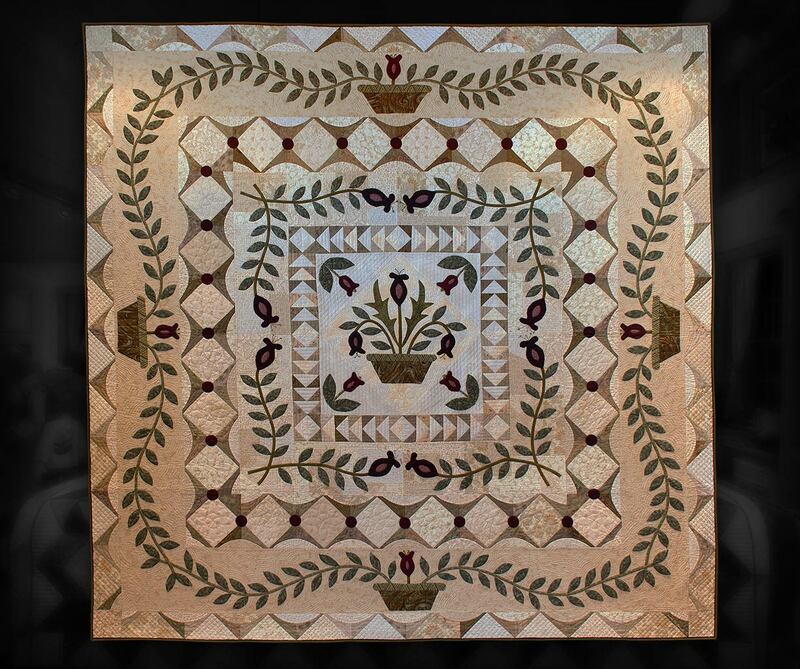 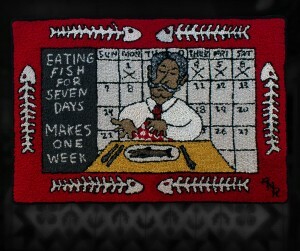 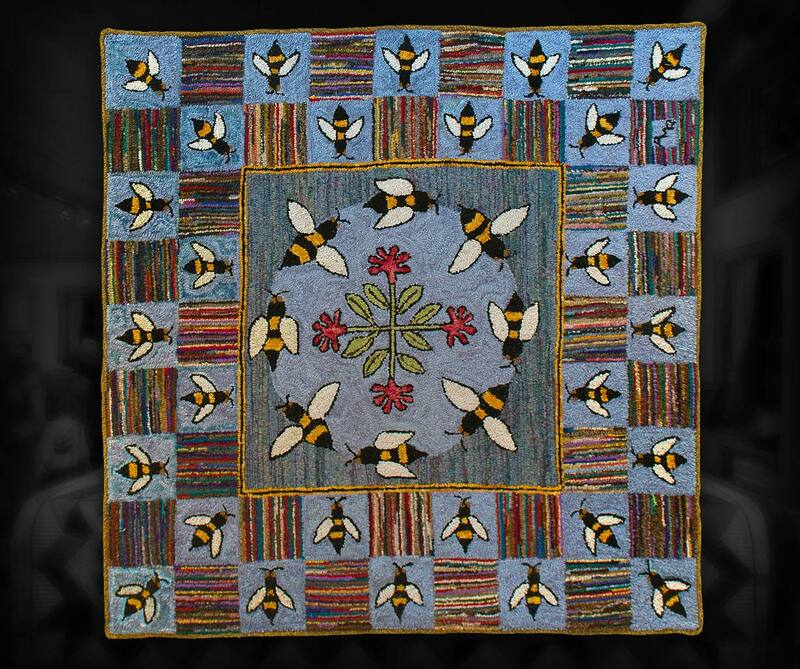 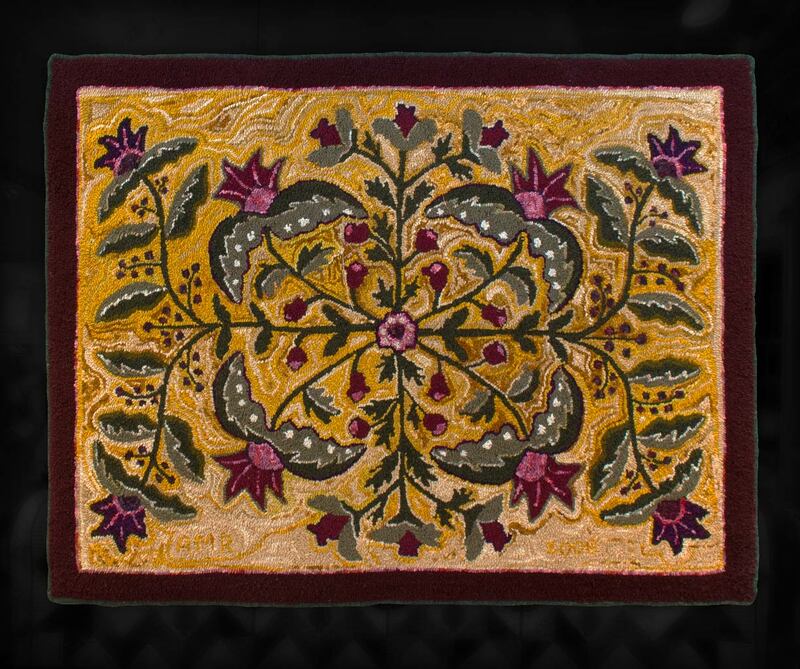 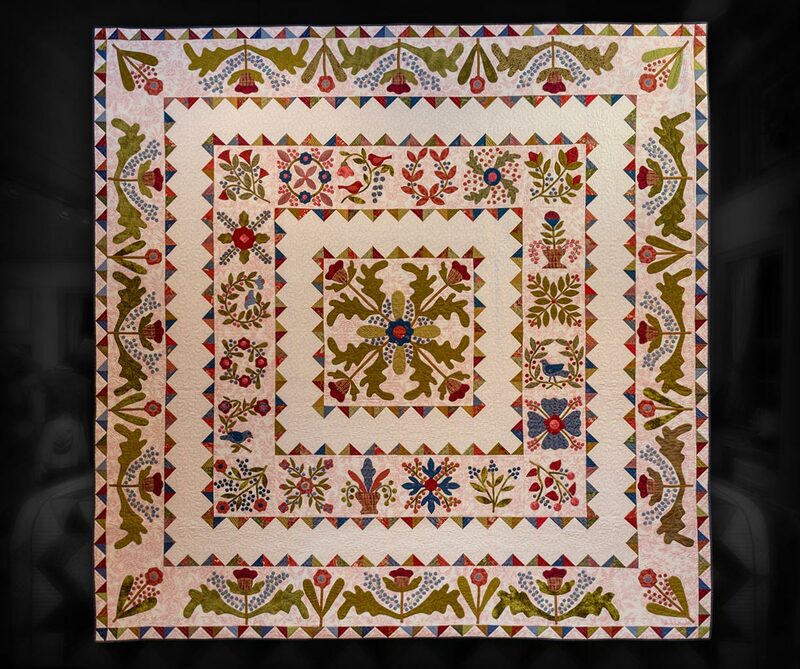 Wool hooked rug featuring the style of an appliqué quilt. 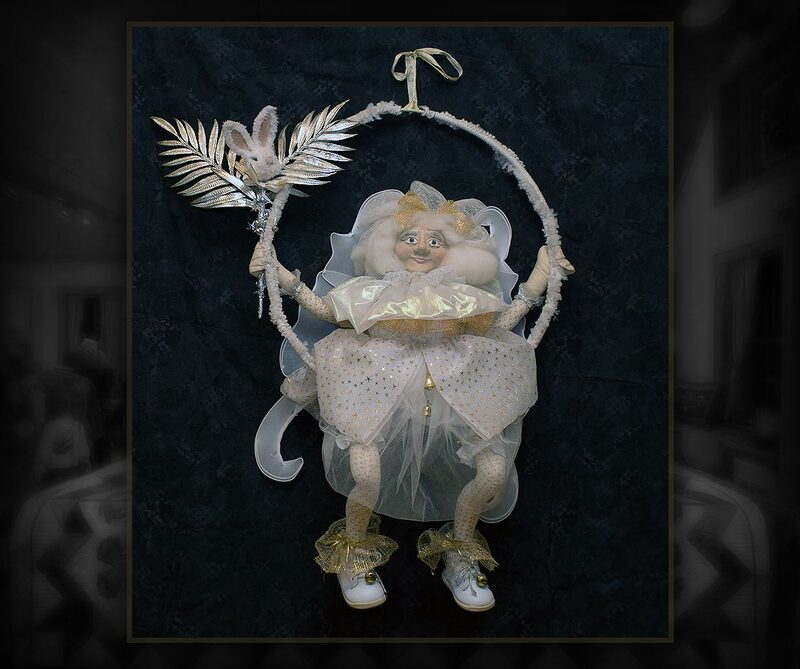 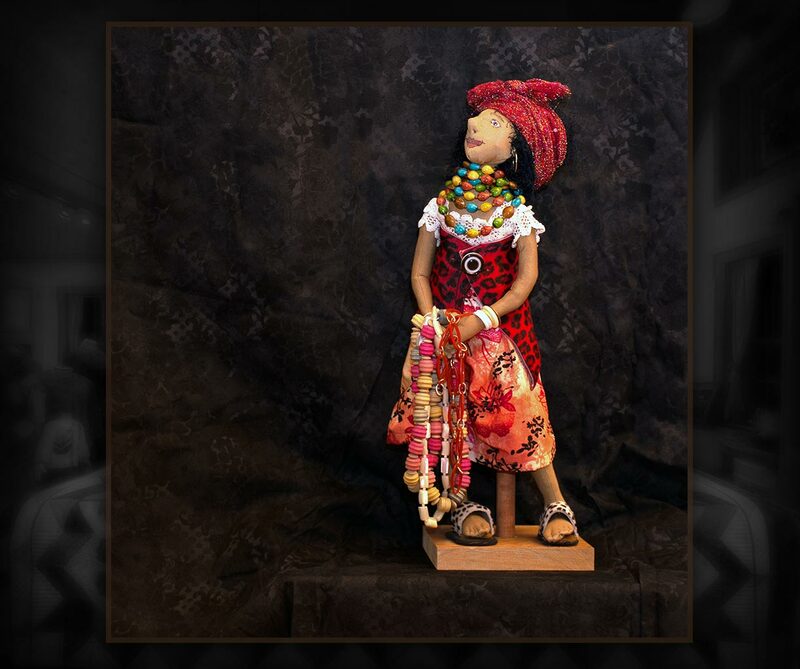 22″ x 32″ – A whimsical cloth and clay doll who would much rather swing than fly. 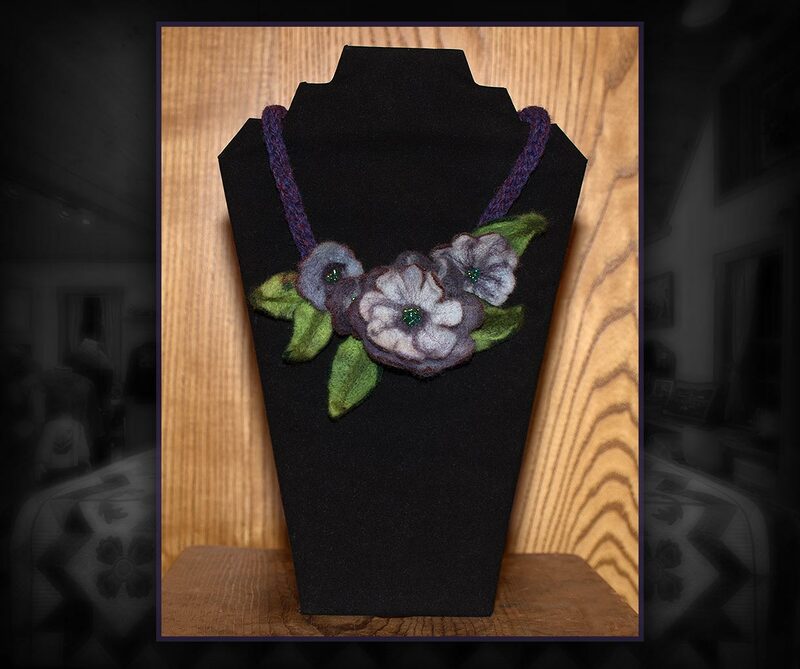 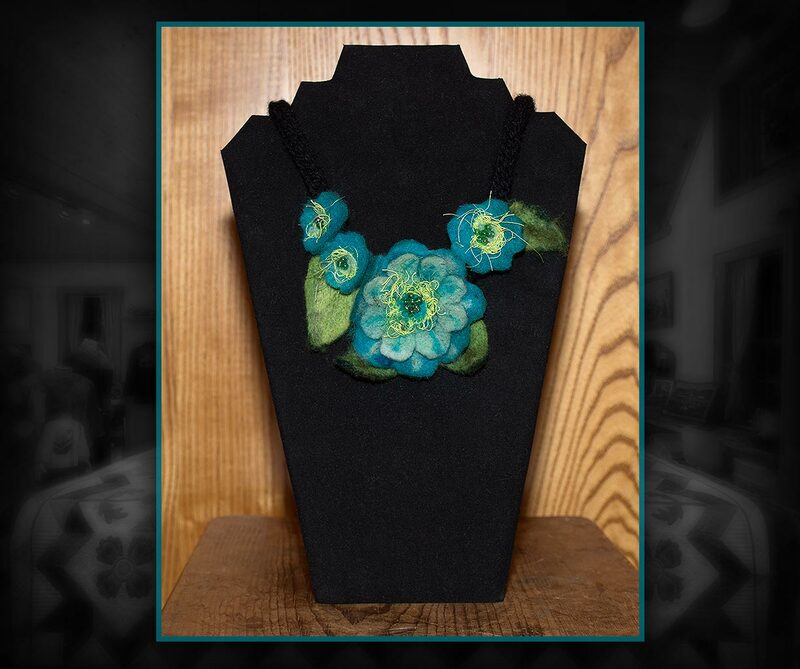 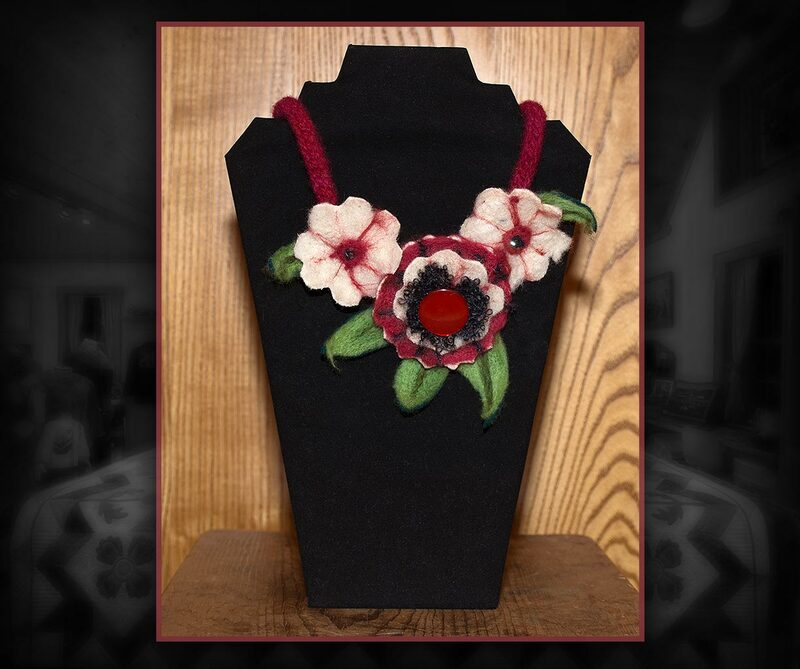 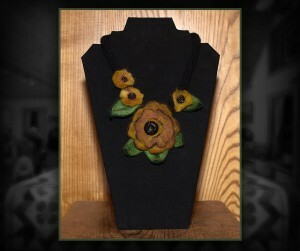 Wool needle felted floral necklace with hand knit cord. Can be made in the colours and lengths of your choice. 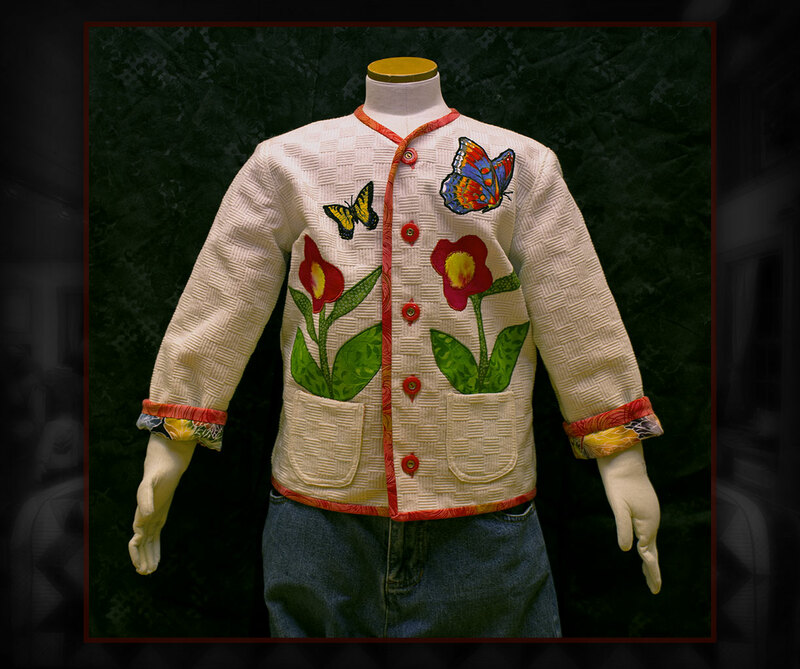 Size 3-4 Toddler. 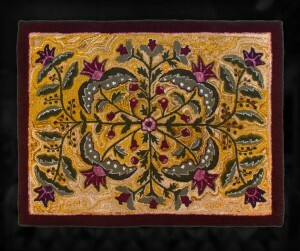 Machine appliqué on cotton, lined with cotton. 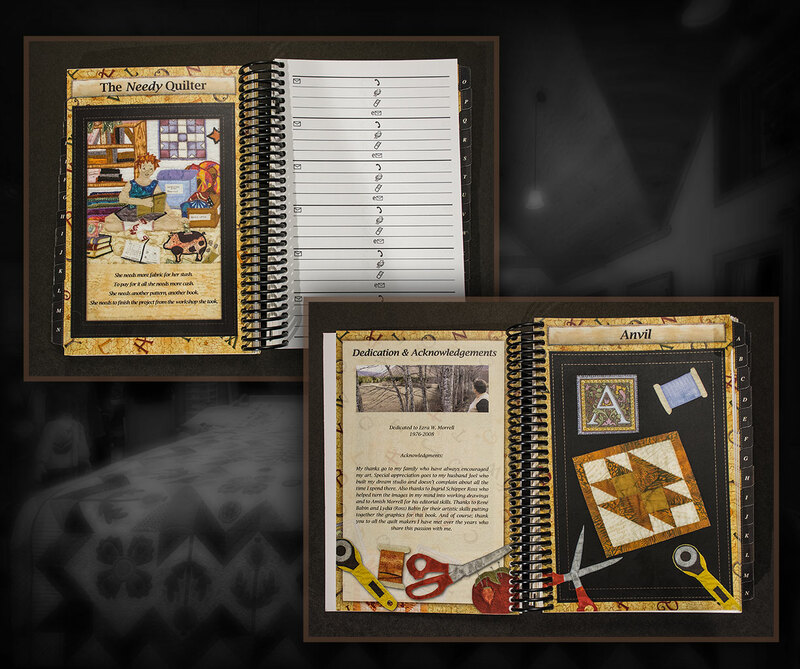 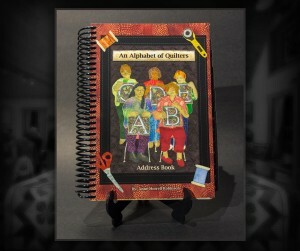 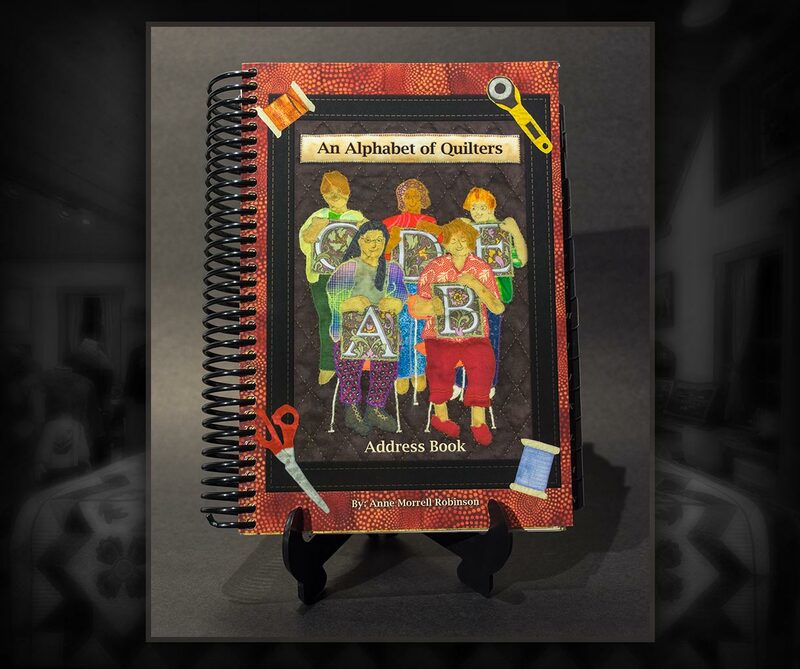 2 double-sided colour pages per letter of the alphabet featuring quilters in action and traditional blocks. 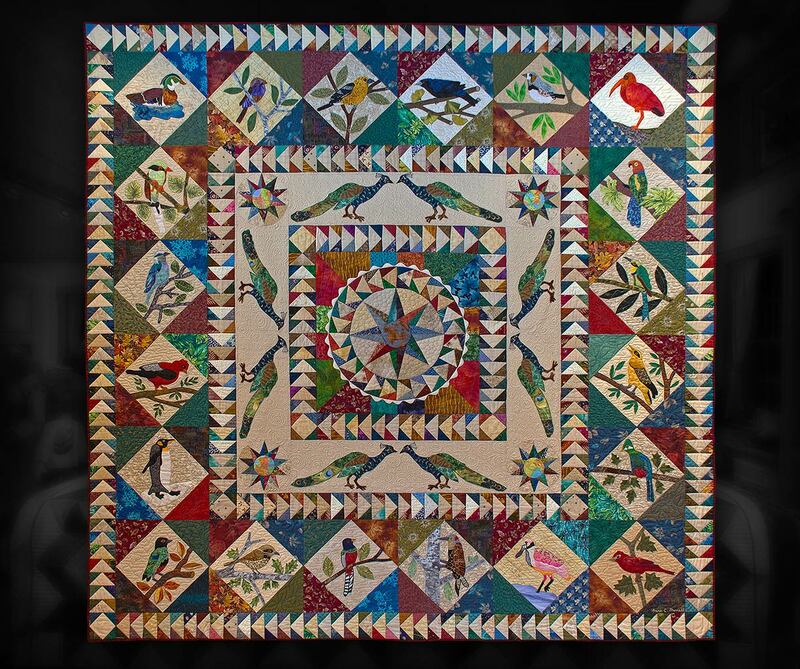 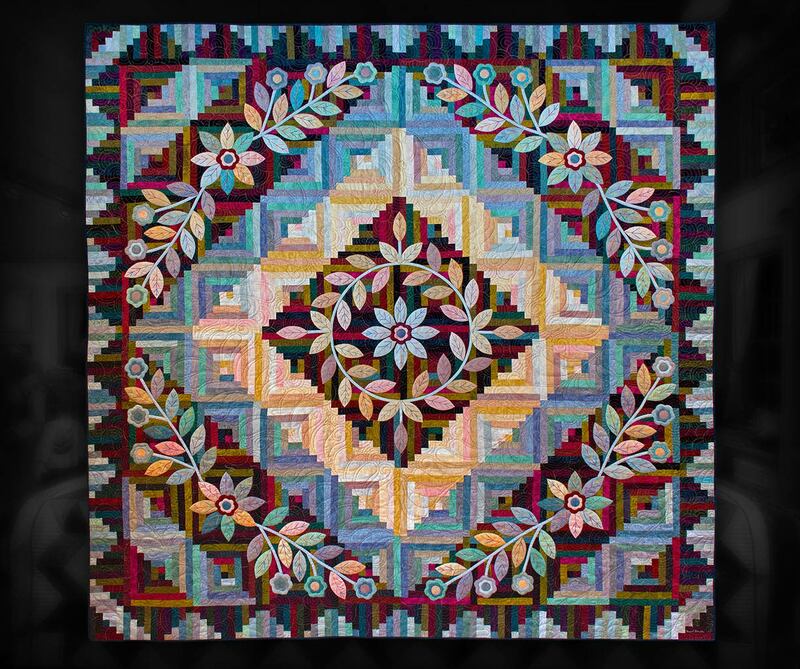 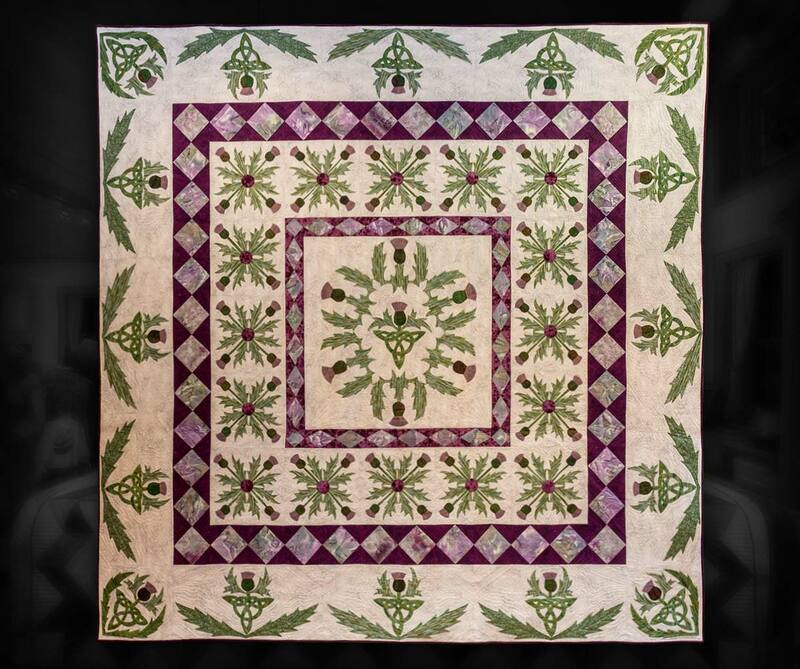 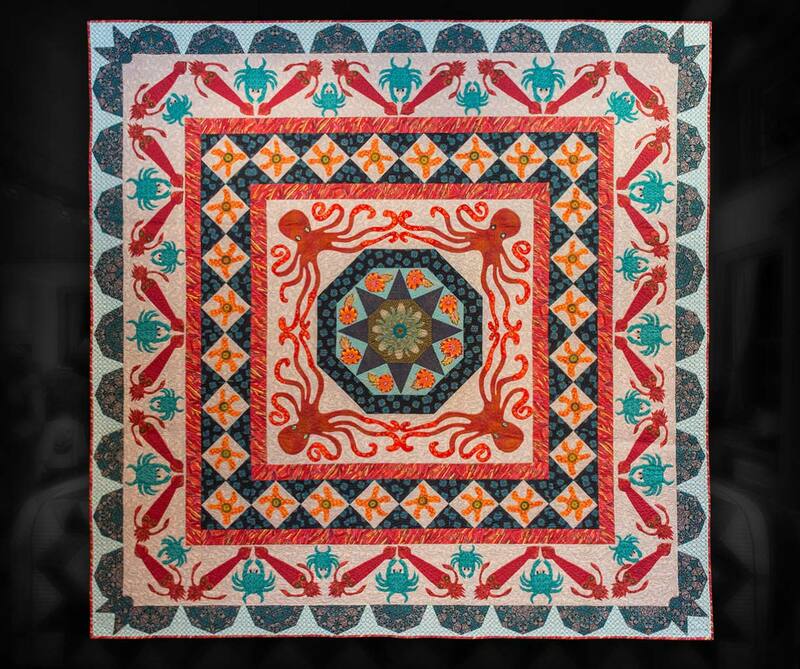 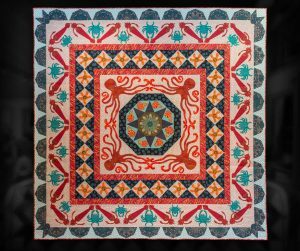 Quilts generally cost between $300.00 and $8,000.00 according to size, style and the amount of handwork involved. 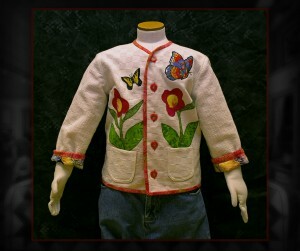 They are designed and constructed on site using top quality cotton fabrics. 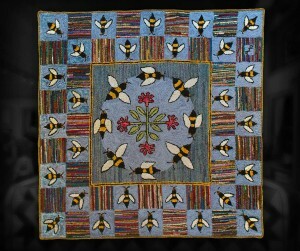 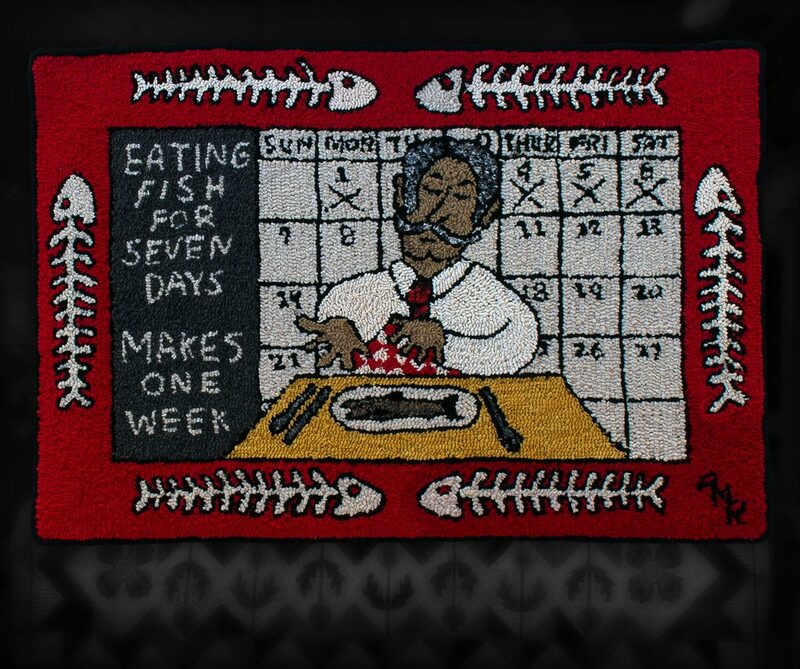 The rugs are hand hooked on burlap or linen using recycled or new hand dyed wool. 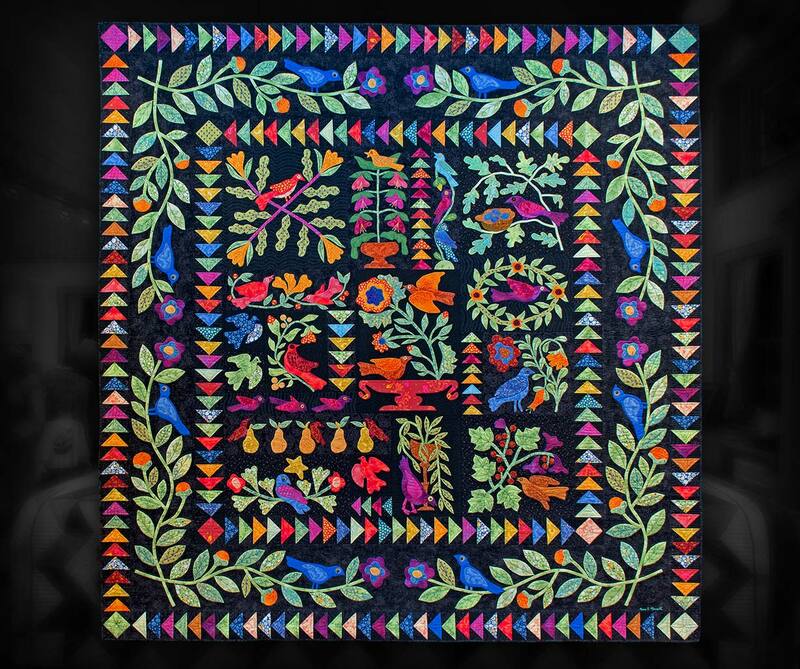 Each one is unique and special. 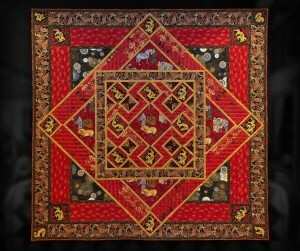 Prices for rugs vary from $75.00 to $150.00 per square foot depending on the wool used. 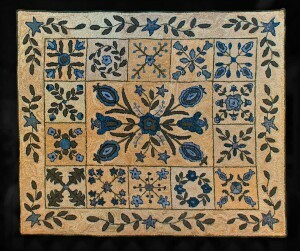 They look great on the floor or the wall. The subject matter changes constantly but animals, landscapes and flowers are frequent inspirations.